If you're wondering, chances are someone else has asked the same question. When did my 2018 KBF Membership expire? Regardless of when you paid your 2018 KBF Membership dues, it expired on December 31, 2018. It was a “2018” membership, after all. We invite all 2018 KBF Members to invite them to renew for 2019 or to become KBF Lifetime Members. I paid my 2017 KBF Membership dues in October 2017. Isn't that good for one year? 2018 KBF Annual Dues became payable November 25, 2018. Some of our TRAIL and OPEN competitors who qualified for the KBF National Championship still needed to become 20187 KBF Members to be eligible to retain their qualification. So did some competitors who were awarded their KBFNC qualification through KBF Partners, but like everyone else, their 2018 membership expired on December 31, 2018. KBF does not have an anniversary-year membership; instead, all memberships expire on the last day of the membership year. 2019 KBF Memberships will expire on 12/31/2019. Yes, there is. While most members opt to renew their membership annually by paying their dues year after year, others make a long-term commitment to helping KBF grow, join KBF, and avoid the yearly enrollment process. Annual membership dues are $50 (at this time; subject to price increases over time). A KBF Lifetime Membership cost $500 through 12/31/2018 and increased to $650 on 1/1/2019. What is the difference between KBF Membership and KBF BONUS BUCKS? Basically, KBF Membership enables one to participate in Member-only activities and take advantage of special discounts. One may become a KBF Member by paying the annual dues, which are $50 at this time, or by becoming a KBF Lifetime Member. KBF BONUS BUCKS is an optional incentive rewards program for KBF Members that provides cash and product bonuses to those who enroll. The KBF BONUS BUCKS Program enrollment fee is $100 for the calendar year. I’m a KBF Member. Does that mean I’m automatically in KBF BONUS BUCKS, too? No. KBF Membership and KBF BONUS BUCKS Program are separate programs KBF Membership is a prerequisite for participation in KBF BONUS BUCKS. KBF BONUS BUCKS participation is not mandatory for KBF Members. What does it cost a KBF Member to enroll in the KBF BONUS BUCKS Program? The fee to enroll in the KBF BONUS BUCKS Program is $100 [Enroll now]. Is there a lifetime BONUS BUCKS registration? No, BONUS BUCKS registrations run year-to-year, and there’s no lifetime option. KBF introduced the BONUS BUCKS contingency rewards program to induce kayak anglers to get involved with kayak fishing competition. KBF Members who want to participate in this optional program enroll in hopes of winning their money back plus some in the same year. Can I give a KBF Membership as a gift? Yes, you may purchase a KBF Membership, setting up a KBF Online Store Account in the gift recipient’s name, or you may purchase a KBF Gift Card (actually a gift code), which that person may use to pay for KBF Membership (with or without a BONUS BUCKS Program enrollment). If you purchase the membership as a gift for another person, please email us at accounting@kayakbassfishing.com so we can make sure our records accurately show your gift recipient as the KBF Member. Does KBF have a Membership level or program for students? Student membership fees are half-price, but they enjoy the same benefits as adult KBF Members. Check the KBF Young Guns web page for more details on youth programs. Everyone in my family kayak fishes. Is there a family membership? Yes, KBF offers a Family 3+ Membership. The first two family members pay the full $50 membership dues. Then, any additional people living in the same household (under the same roof, in the same family group), pay just $10 apiece, which covers the cost of processing each one’s account. Is there a KBF Military Discount? The military discount does not extend to family members (spouse, siblings, parents, children) or extended family. How do I change contact information for my KBF Membership? First log into the KBF Online Store with your email address and password. The next webpage you see will be your account summary, including your address. At the bottom is a link to “Change My Address.” (If you did not create an account when you became a KBF Member, then click “Create an Account” at the top of any store page. There you can change your address, email address, name, and phone number. If you encounter any problems, e-mail kbfjoe@gmail.com with your changes. Please include your first and last name. Does KBF conduct tournaments outside the United States? All KBFTournaments are either inside the US or on border waters, like Lake St. Clair. KBF Members may fish both Canadian and US water in KBF Challenges. How do I save money with KBF Member Discounts? KBF Members receive discounts from a variety of KBF sponsors and merchants who believe in our mission and support our growth. If you’re a KBF Member, open the password-protected KBF Members-ony Page. There you’ll find listed current providers, discount codes, and each vendor’s requirement and restrictions. What is the password to enter the KBF Members-only Web page? Until the end of 2018 that password is…. well, it’s a secret. If you are a KBF Member and don’t remember the password to open the Members Only page, email shopkbf@gmail.com, providing your full name, and we will send that password to the email on your Member’s KBF Online Store Account. 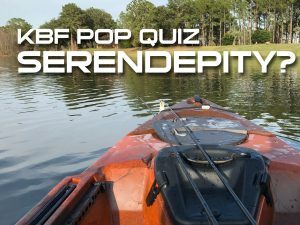 What length of redfish are acceptable in KBF competition? The slot limit KBF adopted was 16 to 27 inches. That means redfish that measure 16.00″ or more, up to (but not including) 27.00″ are acceptable. Photos of fish that fall short of the 16.00″ line or that touch or pass the 27.00″ line on an approved measuring board are denied. In the illustration below, photos B and D are acceptable. Photos A and C would be denied. Do I have to make it to Captains Meetings to compete in KBF TRAIL Series Tournaments? Several TRAIL Series tournaments will hold a Captains Meeting on Friday evening with a make-up early Saturday morning, but not all. Check each event page when we get them all up on the KBF Website for details. For every KBF TRAIL Series Tournament, Chad plans to videotape a Captains Meeting with the TD (possibly on split screen) at least one week prior to competition. We will post them on YouTube with links from the KBF Event page, the Facebook Event Page, and from the TourneyX event page, too, we hope. That way, a competitor who works late on Friday can watch the Captains Meeting online during the week and, by commenting “Reviewed and Agree,” will satisfy the requirement that each competitor attend the Captains Meeting. If someone shows up Saturday morning and can find a strong data signal, he can watch the Captains meeting on his smart phone, and comment “Reviewed and Agree” before he wets a line. What's the difference between a Challenge and Tournament? Both are competitive events. “Tournament” is the term KBF uses for meet-up competitive events. “Challenge” is what we call virtual or online competition, where anglers don’t assemble. $30 Entry Fee for Challenge...? What's up with that? $5 is applied toward administrative costs. That includes $1.17 for PayPal transaction fees (2.9% plus $0.30 per transaction), web hosting and app fees, judging, and other costs associated with setting up and running the event. Another $5 goes into the Championship prize fund, and it will be paid out to KBF Members at that event. The remaining $15 goes into the prize pot for the Challenge. What code goes on my KBF Identifier Form? Use only the 2- or 3-character Event ID Code provided for each event by KBF. 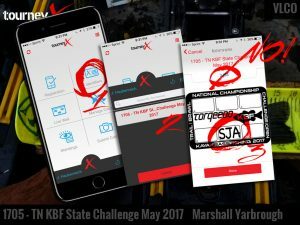 In KBF Challenges, it’s the 3-character code that appears on the KBF Identifier Form in your TourneyX dashboard. For KBF TRAIL Series Tournaments, the Event ID Code is a 2-character code. That’s what TourneyX calls a Unique Angler ID Code (UAID), which it creates with each registration. Each competitor is assigned a different code for each event. That 4-character code appears under the event name, near the top of Screen 3 in the illustration. DO NOT USE THE UAID CODE in KBF Competition. There have been times when new KBF Members, fishing their first event, submitted photos where the UAID was present in lieu of the Event ID Code. In those cases, we counseled them on using the proper Event ID code, made an exception and accepted their fish, and advised them to not use the UAID Code again or their photos would be denied. However, use of the UAID is unnecessary. It offers no benefits to the anglers and just takes up space. The 2- or 3-character Event ID Code is required. Judges have been instructed to deny photos that are submitted without the proper Event ID Code visible on the KBF Identifier Form. I enrolled in KBF BONUS BUCKS. Do I need to mark that on my Identifier? No, a KBF BONUS BUCKS participant doesn’t add a special mark or code to the identifier. When the competition rankings are finalized and the Tournament Director pull them into Excel, he also pulls a current list of everyone who enrolled in KB BONUS BUCKS up to the competition start time. If the top-ranked competitors are on that list, then they are awarded the appropriate bonus. The bonus amount and number of places paid varies by event category and generally increases with the number of event registrants. Can two competitors share a tandem kayak or canoe? Some of KBF Members enjoy taking their small kids out with them as they compete, especially during month-long KBF State Challenges or weekend-long KBF National Challenges. For that reason KBF doesn’t prohibit sharing a boat with another person; however, Rule 6.C. states that a competitor may not receive assistance in catching fish, including boat positioning. In other words, the other person sharing the boat cannot paddle or do anything that helps the angler line up his casts. While it’s okay for someone else to be in the canoe or kayak with a competitor, he must sit still and never dip a paddle in the water, so having two registered, active competitors sharing a watercraft would be difficult if not impossible. When prefishing, can one fish with or get intel from a professional fishing guide? Accepts payment for the service or intel. Provides guide service or intel 30 days or less before start-of-competition. One can hire a guide for service or information on eligible water more than thirty days in advance of competition. Also permitted is picking the brains of and fishing with, even compensating, other competitors, fishing buddies, local anglers, and accomplished tournament anglers, as long as they are not professional fishing guides who work on eligible water. Other permitted sources of intel include forums, social media groups, books, blogs, magazine articles, tournament and fishing reports, conversations with tackle shop owners and other anglers, and coordinated prefishing with other KBF members and fishing buddies. Fish with anyone you want, as long as he doesn’t meet all three of the conditions listed above. What if I accidentally upload a photo twice? Judges are on the lookout for duplicates and will simply deny a duplicate photo or a second photo of the same fish by the same competitor in the same event. TourneyX generates an email to let you know if your photo was accepted or denied. If you upload a photo and want to remove it to submit a better one of the same fish, you’ll need to log into your TourneyX dashboard through a web browser (not the app). When you review your photos, you should find a “delete” button for each one. If that’s not possible, email the tournament director and request a photo be deleted through his dashboard, and when it’s gone, then you may upload a replacement. What water is in-bounds or eligible for KBF competition? KBF defines “eligible water” for each competition. To be eligible, the body of water must satisfy all four of these conditions. Can fish caught from water spanning state borders be submitted in Challenges for either state or region? If a fish is caught according to the regulations of a state and the competition rules, then its photo is eligible submission in that State Challenge or the Challenge of a KBF Region of which that state is a part. For example, a TX/LA reciprocal license agreement exists for Toledo Bend Reservoir. If you hold a fishing license from either of those states and are fishing from a boat, you may legally fish anywhere on the lake as long as you hold a license from either state. If you wade fish or fish from shore, you must have the license of the state in which you’re standing. Why does KBF use the Hawg Trough as its measuring device? Several years back, kayak anglers and kayak fishing clubs were using dozens of different measuring devices. KBF began conducting online or “virtual” tournaments and addressed the need for standardization. At that time, KBF management evaluated all the measuring boards on the market, including the good, ol’ trusty Golden Rule, beloved by bass boat fishermen. KBF wanted a very durable, accurate, tamper-proof, floating board with quarter-inch increments that showed up clearly in photographs, curved to hold fish more securely, and that was a fair value in terms of price. Nothing like that existed at the time, so KBF selected the one that came closest — the Hawg Trough. Was it perfect? Obviously not, but it was the best alternative commercially available then. That’s about to change. Since then thousands of kayak anglers have bought Hawg Troughs, which has enabled us to be consistent, fair, and objective in judging events. Even when better solutions become available and are approved by KBF, Hawg Troughs will still be acceptable in KBF competition for a specific transition period. KBF has never been involved in Hawg Trough manufacture nor do we receive any financial consideration from their sales, either from the manufacturer or from retailers. We, too, are keenly aware of the deficiencies of the current product and approached several manufacturers over the years with suggestions and requests that they produce improved measuring devices. Two of America’s top kayak gear manufacturers have stepped up and are in the final stages of development of radically improved measuring boards. We expect them to be out in the next few months. From what we’ve seen so far, they will be much better than anything available on the market today. KBF does not require Hawg Trough lines to be inked, though we encourage the practice. Competitors are free to ink them or not…to paint them in camo or weird, psychedelic patterns if they prefer. Some smear ink or paint across the boards and scrape off the ridges so they stand out clearly. That’s fine, too. No matter whether a board is inked or not, or how sloppy it is, KBF judges do our best to evaluate each photo so scoring on every single fish is accurate and consistent with our rules and standards. We enlarge photos 500% or bigger in our browser views, export them to Photoshop to enhance visibility, contact competitors and request alternative photos of the same fish, and/or ask other judges to offer a second opinion. We do all that to be fair to you. Well, not to all of you, because as far as I can tell, some of our most vocal critics in this topic have never competed in a KBF event and are not on any KBF Partner roster that has been provided to us. But we go to extremes to be fair to kayak anglers who are actually competing in KBF Tournaments and Challenges. Some might call that nit-picking. If so, they’re right. We nit-pick to make sure that every competitor gets the maximum score for each fish he submits. From time to time KBF will advise anglers on best practices because we’re committed to conducting professional, fair competitive events and to helping the anglers who participate in them maximize their scores. How can a Hawg Trough be modified? KBF recommends that competitors ink the raised measurement “ribs” of their Hawg Troughs by laying a permanent felt-tip ink pen over on its side and stroking the top of each rib. Make every effort to get ink only on the top of each rib and not off to one side or the other. Hawg Troughs with quarter-inch marks where ink is also on the board–not just on the ribs–slow down KBF judges (and sometimes cost competitors a quarter inch in length). Judges have seen them inked off to the left of the measurement ribs, to the right, and sometimes fat ink lines spill over both sides. In this photo, for example, thick inked lines are to the left of the ribs. Although the caudal fin tip touches the inked line, making it appear to be 17.75″, enhancing the photo (as represented in the lower image) shows that the fin falls short of the ribbed line, so KBF judges would score this fish as 17.50″. Laying your Sharpie over at a flat angle and running the side of the felt tip along the top of the rib, as shown in “B,” deposits a line of ink along the top of each rib. A steeper angle (as in “A”) makes following the top of the rib more difficult. At any rate, if you want to help KBF do a more accurate job of judging, please ink just the top of each rib and not off to one side or the other. What does KBF do when an identifier in a photo is damaged, partially covered, or the lighting makes it hard to read? 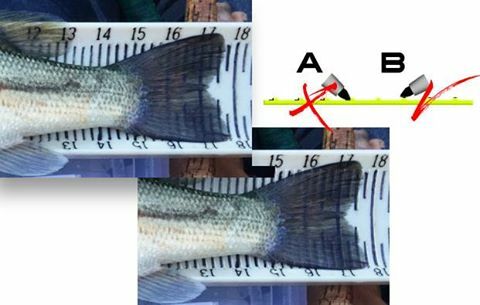 Whether bass photos in KBF Challenges should be accepted or disqualified based on the readability or legibility of an identifier is an important question. We see photos in almost every event where we have to exert extra effort to validate an ID that is not completely legible. We want all our members to fully understand our rules and rationales. We enter into a contract with each angler who registers to compete in KBF competition. KBF agrees to conduct a fair, impartial, professional event and make judgement calls in accordance with the rules, without bias or favoritism. The competitor agrees to comply with the rules and abide by the terms and conditions of competition. To that end, the judges in KBF events bend over backwards to evaluate each fish submitted to us on its merits, within the rules, and disqualify photos only as a last resort. When possible, we impose progressive penalties for some infractions, like a bass’s mouth being open, instead of denying the photos outright. Our intention is to accept every fish photo we possibly can. Trying to do right by you, we go back to the first-generation photo and use several photo-enhancement techniques to help us make some photos more readable. When we’re able, we also compare identifiers in ones where they are overexposed, damaged, or partially obscured or cropped off to ones in more legible photos from the same angler in the same event. If a photo provides enough evidence for the judge to authenticate an ID, we accept it. However, when KBF Tournament and Challenge judges are absolutely unable to make out the identifier marks in order to validate an ID, we DQ the photo. The illustration for this post are pretty typical of photos we get with the partially obscured or overexposed ID forms. When, by looking at other evidence, we are to verify with 100% confidence that it’s the valid ID with the required marks, as in examples A and B, we approve the photo and proceed to judge it by the rest of the criteria. If we can’t, as in C, then we DQ the photo. We appreciate each competitors’ vigilance commitment to KBF rules compliance. If you suspect an infraction or wish to report your own violation, the process described in KBF Rule #16.A. is to inform the event’s TD privately, within 24 hours, and in writing of any suspected infraction and provide evidence substantiating the charges. Why do we have to lay the fish on a Hawg Trough facing left? Bass scale patterns and identifiable markings vary from side to side. 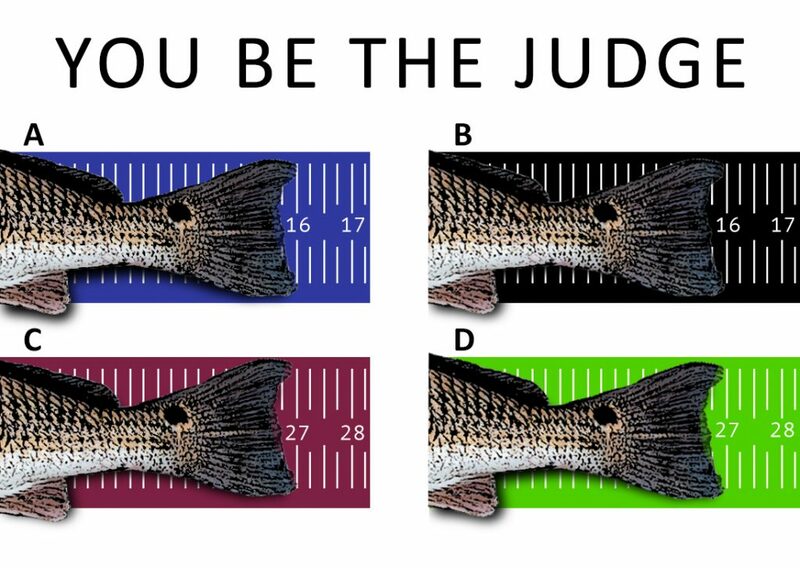 It’s possible for a judge to not recognize the same fish laid both to the right and left, so to make identification possible, all fish must be laid on a Hawg Trough facing to the left, left eye up, belly toward the bottom of the photo. Why can't I count a fish twice in the same event if I catch it again hours, days or weeks later? Unfortunately, it’s done because it closes the door, at least partway, on many ways of cheating. The temptation to stow a big fish in a net and feed it for a weeks or two before “catching” it again has proven irresistible to some bass fishing competitors in other tours. We want to discourage anyone from trying this. Also, if that were permitted, someone might catch a 24-inch bass in a tiny pond and then release and re-catch the same bass several more times during the competition, thereby winning with just one big fish submitted over and over. Finally, it discourages competitors from taking multiple shots of a fish—sometimes with wardrobe and staging changes for subterfuge—and then submitting those photos over a period of time. What rule infractions result in a deduction in length? Judge unable to determine with certainty that a fish is in contact with the measuring board fence. Low camera angle so a judge is unable to determine it the mouth is open. If it’s possibly open, the open-mouth deduction applies. For a complete list of scoring infractions, refer to the KBF Competition Rules Standards. Why is length deducted for a fish having its mouth open? Because the way a bass’s jaw is hinged, opening the mouth increases the length of the fish. For consistency, KBF requires that the mouth be completely closed for digital photos and deducts points (inches or fractions of an inch) depending on how wide the mouth is open. The wider it’s open, the greater the deduction. Refer to the KBF Competition Rules Standards. What if the mouth on my bass won't close? Then it will have points deducted for having its mouth open. It’s not as though you have any choice in the fish you catch. If you caught one that had its tail bitten off, we would measure only to the stump. In a weight tournament, a bass might have been injured and off its feed so that it comes to the scales with a caved-in belly, where a month one way or the other might add two pounds to its weight. That’s just random chance. Judges just apply the rule, regardless of the fish’s deformity. What rule infractions result in denial or disqualification of a photo submitted for scoring? A fish that is covered by the competitor’s hand, making identifying the fish or determining whether it’s alive or dead impossible. A photograph that is so unfocused or in which the camera shook during the photo to produce a double-image, making accurate measurement and determination of the fish’s condition impossible. A photo with the fish upside down, facing the wrong direction, or on another measuring device than the Hawg Trough. What standards do judges apply to ensure standardized, objective scoring? The scoring criteria and penalties are outlined in the KBF Competition Rules Standards. It is an Internet application that is accessible through a smartphone’s or computer’s wireless network or through hardwired networks. C-Competitors log into TourneyX on the water and find the upload button in their “dashboard.” On-screen instructions guide the Competitor through the process of supplying the fish’s length and uploading the digital photo. When received, the date (digital photos are converted to a bunch of ones and zeroes, like in The Matrix) are stored in a database. Anyone with access to the application can see some of the photos. The screens judges use allow them to change the reported length, subtract points, and either approve or deny each photo. Judges can also add comments, which the competitor receives via email. What do I do if I'm out of cell range and cannot upload a photo to TourneyX? In a meet-up tournament, bring you memory card or your camera/phone and a cable for uploading the data to the judges check-in station. Can I submit the same photo in more than one Tournament or Challenge? Yes, as long as a photo complies with all rules for each event. KBF competitors may fish as many concurrent competitive events as desired and may submit the same photo to every Challenge or Tournament for which it is eligible. If a fish is legally caught during competition hours from public-access water considered in-bounds for each of those tournaments, the same photo of that fish may be submitted in every tournament for which it qualifies. If I don’t have a Smart Phone, how can I submit photos to TourneyX? In tournaments, you will need to return early (see the KBF Competition Rules Addendum for the event you’re fishing) to turn in your media, which means removing and handing in the memory card or turning in your camera or camera/phone with a USB cable for downloading data. Judges will give you a claims slip and put your card or phone in a resealable plastic bag labeled with your name. After the data has been downloaded and the judges then upload your photos to TourneyX and verify that they display properly, then you’ll be called back to retrieve your memory card or phone/camera. In Challenges, find a computer connected to the Internet, download your photo the that computer, open a browser, log in at tourneyx.com, and submit your photo(s) through the dashboard. May I wade and fish in a KBF tournament? Do not trespass on private property, and do not cross or enter any area restricted to the public to get to eligible water. Can I use “mothershipping” in a KBF-sanctioned tournament? No, you may not. That is forbidden in the KBF Rules. What fish species can be submitted for scoring? Unless otherwise specified in the KBF Competition Rules Addendum for the event you’re fishing, any “black bass” is permitted. To see the complete list, refer to the KBF Competition Rules Standards. Do fish have to comply with local length limits and slot restrictions in order to photo and submit for scoring? Competitors are required to comply with all fishing regulations for the eligible water; however, length restrictions only apply to fish that are kept. There are no rules restricting the catching and release of and particular length fish. The fact that between the catch and release you snap a photograph is not an issue, either. So no…local length restrictions are irrelevant in CPR tournaments. Is there a minimum length for fish submitted in a KBF Event? KBF will specify the minimum length for each Challenge or Tournament (either 8″ or 12″) in the KBF Event Rules Addendum. In a three-fish tournament, how do I submit a fourth fish if it’s bigger than one or more of the ones I caught earlier? Most tournaments are set up with “auto-cull” in effect, so if you’ve reached you limit, photos submitted with a higher score than one previously submitted will bump it. To do this manually, select your shortest fish and eliminate it by clicking the “Cull” button. That clears room for you to add another fish in its place. What can I do if I cull a fish, and then the one I culled for is denied or DQ’d? What is the “stop fishing” time, and how long do I have to get to a place where I can upload my photos? End-of-competition time, photo upload deadline, and check-in at Tourney HQ times should be clearly stated in the KBF Event Rules Addendum. If I disagree with a judge’s score or ruling, what should I do to challenge it? First, the only Competitors who have standing to dispute a judges ruling regarding another angler’s score or penalties is one directly affected in rank or rewards. If you feel like a mistake has been made or a judges ruling was unjustified and you would like it reviewed, your first step is to go directly to the Tournament Director and inform him of the issue. Do NOT air your grievance with other anglers and attempt to gain support from a group; that’s going to backfire on you. Tournament Directors, more than anyone, are committed to impartiality, objective and fair judging, and consistency in applying the standards, and they are responsible for determining the course of action when a situation arises that is not specifically addressed in the rules. You may do this any time with 48 hours (the “dispute period”) after judging has ended. Instructions for appeals are spelled out in the KBF Competition Rules Standards. Are electric motors allowed in KBF-sanctioned tournaments? If I fish on a reciprocal license border lake, can I submit fish caught anywhere on that lake? If border states have reciprocal license agreements (licenses from one state are valid in the bordering state’s water), then yes; you may submit fish to events in either state that you catch in the reciprocal license area of that lake. However, if there is no reciprocity, then you may submit fish to the Challenge caught in the water of that state or region. Why must I report in early if I can't upload them from my smart phone? The point of using TourneyX is for speed, accuracy, and consistency. All digital photos must be entered into TourneyX prior to scoring. If you cannot do that on the lake or on your way back to Tournament HQ, then the judges will need to do that for you. It takes time to collect and label the camera or smart phone, download the images, and then manually upload them to TourneyX using the judges dashboard. Rather than make all the other competitors wait on the few who cannot or choose not to upload to TourneyX, we require those competitors to report in an hour early. Why do you let competitors enter the same fish photo in two different tournaments? This practice seems strange to bass tournament anglers who cut their teeth on bassboat tournaments. One of the advantages of CPR-type tournaments is that an angler can sign up for several tournaments and submit the same photo of a fish in all of them for which he is on eligible water, during competition hours, and withing the rules of each event. KBF allows competitors to participate in concurrent tournaments. This topic has been fussed, cussed, and discussed. Before it reaches the “percussed” stage, Chad and I assembled all the opinions and arguments pro and con, and we weighed them carefully. We concluded that this practice serves the interests of individuals and the whole kayak fishing community. First, let me address the “it just doesn’t feel right” view. We respect that gut reaction. We, too, have encountered situations that seemed uncomfortable, risky, or shady to us, and even though there’s nothing we can exactly put our finger on or even express in words, we hear the auto-pilot in the back of our heads screaming “Pull up! Pull up!” That little voice is the accumulation of years of conditioning and life experience. Sometimes it can save us from ruin, pain, and loss. But sometimes we all should step out of our comfort zones, consider new ideas, gain new experiences, and do a careful risk-benefit analysis, and we may decide to override the autopilot and switch to manual control. If your first instinct is to cry foul and what’s been mischaracterized as “double-dipping,” please consider our perspective. Here’s our view. If you sign up for one tournament, catch a fish by the rules, submit the photo, and see how it stacks up against the competition, everyone’s happy. If there’s another tournament and you do the same for it, fishing only that other tourmament, all is well and good. In either tournament, you caught developed your strategy, but in your time, money, and effort, applied your skills, and you pitted yourself against others in those same competitions. So what’s the difference if you are fishing two concurrent tournaments? You’re still competing against all the other anglers in each of the two tournaments. Each fish you catch, photo, and submit for judging stands on it own in each competition for which it’s entered. 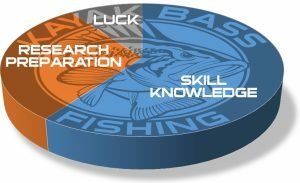 The way KBF and other organizations’ events are scheduled, often there is overlap, and an angler can fish not just two but as many as five (or more) competitions at one time. For example, a fifteen-year-old angler at the 2017 KBF Rendezvous in Paris, TN could fish the KBF Young Guns, KBF OPEN, KBF National Championship, KBF HOW Big Bass Brawl, and on Saturday, April 1, submit fish caught that day in either the Tennesssee or Kentucky April KBF State Challenge. 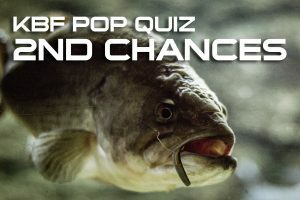 That’s actually six concurrent events for which any fish caught in reciprocal waters of Kentucky Lake or Barkley on Saturday would qualify, assuming the angler has entered every one of those tournaments and Challenges. There’s noting inherently wrong, dishonest, unethical, or however else you might choose to characterize this practice. It may not be how it was done in the bass tournament culture in which you were raised, but that just means it’s different that you’re used to…not wrong. Bottom line…don’t violate your conscience. If you are entered in two, three, four or more simultaneous tournaments or challenges and catch a state-record class bass and feel it’s wrong to enter it in more than one competition, then don’t. Choose one and enter it there. You’re still competing againt others in that one competition, and your chances of winning are pretty good with a bass of a lifetime to your credit. However, don’t denegrate or abuse anglers who choose to submit a photo of a quality fish in as many competitions as he can. That’s the culture we’ve established here, and it works just fine for us. The director selects each tied competitor’s biggest (that is, highest scored) bass from among all that contribute to the tied score. The duration or number of days in a tournament is immaterial; all photos that contribute to the total (tied) score are considered. The tie breaks in favor of whichever competitor has the biggest bass. If the biggest bass are equal, then the second-biggest are compared, and if they’re the same length, then the third…and then the fourth. If all four of the biggest bass are identical, then the tie breaks in favor of the angler whose upload time for his final bass was earliest. Pete and I tied, and I submitted my fish first, so how come he's ranked above me? Most likely it’s because Pete’s longest fish was longer than your longest fish. Ties in total length are broken by the longest bass for each of the tied competitors, and if they’re the same, then the second longest, then third, etc. If all fish are identical, then the photo upload time stamp of each competitor’s last fish on the leader board breaks the tie. If I break a fish off, snag my line with another lure and then retrieve the fish by hand, can I submit it? Cast your Senko by a laydown and, as it drifts down into the tree’s shadow, feel a tick. Pause… lift…bump…reel down… Whammmmmmmm-SNAP! Snap? SNAP!? Hey, where’s my fish? WHERE’S MY LINE???? Somewhere out there. Broke right at the rod tip. Aaaarrrrgh!!! How’d that happen? Inspection reveals a cracked tip guide. Rats! Felt like a good fish, too. Well, that rod’s toast for the day. Snip off a jig from another rod, tie on another 4/0 hook and dig out another Senko. Work on down the bank and give that log a few minutes to cool down, then swing back by for a second try…first probing the outer edges with your crankbait. As it flips over a branch, your plug feels different. Spongey. Leaf? Nope… fishing line. MY FISHING LINE! Has to be. I wonder…. Hand over hand a few turns, and then a firm tug on the other end. Woah, that fish is still on! Careful…watch it. Easy… guide it out, don’t horse it or it’ll wrap you up. There it is! Dang! Easily 18, maybe 20 inches. It gets a look at you and dives, rocking your kayak, but you’re able to turn it, bring it back and lip the bass! Wow…Oh, wow! Hand still shakes a bit as you try to steady your camera for a shot. Identifier. Check. Fish facing left with jaw against Hawg Trough fence….good. Hand away from the gill flap: check. Lure is still hooked on the right side of the bass’ mouth, under the fish; out of sight, preventing the mouth from closing completely, but you’re focusing on getting the tail positioned so it nicks the 19.25” line. Six quick shots, check them…great; everything there, not blurry or cropped. One glamour shot, remove the hook, then back in the lake. Next, pick the best photo, enter a score on TourneyX. What the heck! Didn’t notice that mouth open an eighth of an inch. Crud! Oh, well, still a good fish. If something like this happens to you, take a glamour shot so you can show it to people when you tell the story, but do not submit this fish for scoring. By rule, to retrieve the fish and it be admissible, one must retrieve the line by hand or by scooping it up with the rod from which the line broke…no other way. Not another rod. Not a lure, lure retriever, or stick. To secure the line by those means is not permitted by the rule and would constitute a willful, deliberate violation. Can I count a fish that grabs a lure hanging in the water from one of my rods lying on the deck? Heres’s a typical scenario: During a KBF tournament, a competitor laid aside a couple of rods on his front deck as he and a buddy drift up a bank, each picking up a bass from time to time with spinnerbaits. Just as he finishes one retrieve and prepares for his next cast, he hears one of the spare rods scraping across the deck and notice a bend at its tip. He grabs it, sets the hook and flips a nice 17.25″ bass into the boat. Can he photograph and upload it, according to the KBF Rules? No, he should not do that. Rule 9.F. applies here. The white frog bait hanging at the end of a rod in the photo at right is in the air, not on or in the water. Notice the other rod is bent and the line stretches off into the water. An inattentive competitor might lay his extra rod down with enough line out so that the lure is in the water, where it can be grabbed by a bass. According to Rule 9.F. only one rod and reel may be in use at a time. Since a lure out of the water is considered to be NOT in use, then a rod with enough line out so the lure is in or on the water IS considered in use. If a competitor is casting away with one outfit and another is lying on the deck with the lure in the water, then he is in violation of the rules during the time when he has two rods in use. Any fish he catches during that time should not be submitted for scoring. Therefore, the angler in this scenario must release the fish without submitting a photo. In fact, it’s unlikely that a judge would know of the infraction (unless the competitor or his buddy happened to mention it). But if anyone reports the infraction, it’s going to be bad news for the competitor. This is one of those rules where the angler has little chance of pleading ignorance. Every competitors agrees that he has read, understands, and will abide by the rules (including 9.F.) If an angler hooks a fish on his spare rod, lying on the deck, there’s little doubt he knows that submitting the fish is wrong. Would anyone do this? Well, if the fish caught in violation of the rules was big enough to win him a pot of money, a competitor might still be tempted to take the chance. All he’s risking is loss of self-esteem, disqualification from the event, banishment from KBF, and legal action that could lead to fines, jail time, loss of livelihood, shame, ridicule, and scorn. I work nights, so everyone fishing night events have an unfair advantage over me! Make tournaments fair! Okay, let’s eliminate all tournaments where anyone’s work schedule conflicts. And let’s eliminate competitions that reward people who live in states where big largemouth bass predominate. We could do that by picking secret target numbers at random at the end of a competition, and whoever gets closest to that number places first, second closest second, and so on. And eliminate Entry Fees over $20. And allow no competitor to use equipment that costs more than everyone can afford. We’ll cap the kayak price at $600. No paddles over $140. No electronics, no electric motors, no pedal drives since they’re beyond the reach of some competitors. And no more than two rods, neither of which can cost more than $60, matched with reels of no more than $80. No expensive fluorocarbon lines. No lures that cost more than $6 apiece. Of course, no pay-to-fish lakes. And no lakes owned by private citizens or businesses…only “public” waters controlled and regulated by federal, state, and local governments. No one can fish more than 50 miles from home or stay in expensive hotels or lodges. Then maybe we can hold tournaments where everyone has an equal shot at winning. How can a paddler compete against anglers with pedal drives or electric motors? All things being equal, speed and range make a difference. When it comes to tournament fishing success, though, it’s neither an electric motor or pedal drive but TOW (time on water), skill, knowledge, experience, arming oneself with the best info possible that wins tournaments. Gear is no substitute for those. A skilled tortoise usually beats a speedy hare. Watch Chad’s 60:30:10 rule YouTube video. Get organized and comfortable with your gear setup so during tournament you have less anxiety and your “work flow” is smooth. Practice on your own body of water at a tournament pace, employing a tournament strategy, by holding a one-man “self-tournament. Set yourself a typical tourney start/end time and push yourself to boat five keeper bass in that time. Identify the ways you lose fish and figure out what you can do to eliminate or reduce them. Research the body of water. Google earth. Navionics app. Develop a game plan. Prefish on the competition water if you’re able.